For those of you familiar with my blog No Fear, Just DIVA then you know it is all about Finding Your Fashion Freeway and how you are getting to that Point B, or final destination, in your career. Sometimes we use connectors, the indirect path to Point B. One of my Connectors is Toby Bloomberg of Bloomberg Marketing/Diva Marketing. Do you have a unique shoe accessory or gift that you would like me to feature on my blog and sell in my boutique? Email me at shoe_smitten@yahoo.com or leave me a comment on here. So far I will be selling Shubi shoe bags, Absolutely Audrey shoe clips, designer shoe greeting cards and more. I am always looking to promote new companies and independent artists! I have decided to presented a series of photos from a designer named Dean Alan. The fashion photographs are by Massimo Conti. During the next few weeks, I will display new fashion images for your viewing. I hope that you like them... The fashion image that you see on this blog post is the 8th in the series. 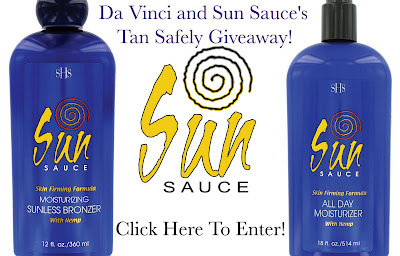 TOMORROW IS YOUR LAST CHANCE TO Enter To Win Da Vinci and Sun Sauce's Tan Safely Giveaway!!! Open to residents of female residents of the 50 United States, District of Columbia and Canada who are 18 and over. Ownership: Privately held. Raised $400,000 in funding from Fairview Funds. Mission: To provide the most efficient platform to connect and perform transactions with freelance professionals locally, nationally, and globally. Damiani has chosen iconic screen siren Sharon Stone as the new face of the Damiani brand. I have decided to presented a series of photos from a designer named Dean Alan. The fashion photographs are by Massimo Conti. This is the sixth fashion image in this blog series. Would you like to be featured on About Jewelry? Since her role as Wednesday in The Adam’s Family, Christina Ricci has changed quite a bit. The little black-haired girl has transformed into a beautiful fashion icon. Always up to speed with the latest trends, Ricci is stunning with her new bob haircut. Visit my site at http://emaildiva.net! The Danish-designed line, produced in Bolivia under fair trade principles, is made from the longest, finest llama fibers and is what you’ll reach for on cool summer nights — and straight through to winter. Are you familiar with GEOX? My son has been wearing them for years, but I never knew much about the company. They are actually an Italian shoe company. If you sew closed your pockets, you can cut out the lining material used to form the inside of the pocket. This may remove a tad of the bulk. SHOPPING FOR THE ROCKER THAT HAS EVERYTHING? I have decided to presented a series of photos from a designer named Dean Alan. The fashion photographs are by Massimo Conti. This is the fifth fashion image in my blog series. Sretsis, known for it's chic, flirtatious yet sophisticated and whimsical designs, takes their vision of utopian dressing to the next level with their Fall 2008 collection, aptly titled "Parallel Universe". Learn more at the Sretsis site.